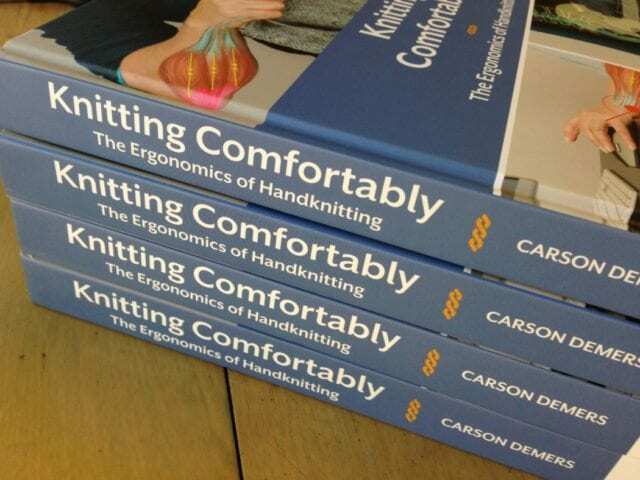 Back in stock: Knitting Comfortably. 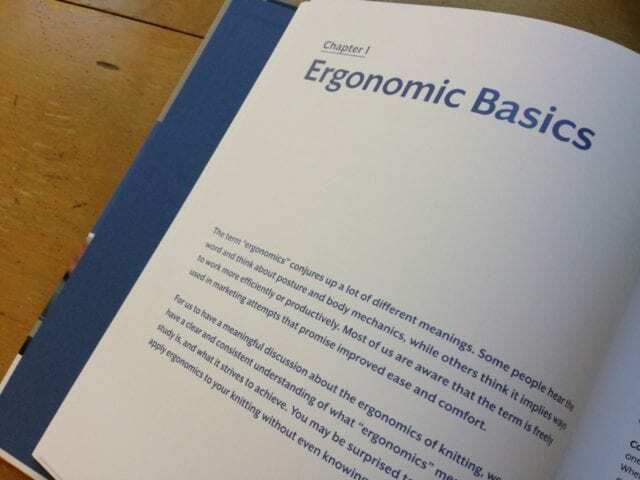 Today a big box of books arrived at the shop, a second batch of Carson Demers’ instant classic, Knitting Comfortably. Our first order sold out soon after it arrived, back in November, claimed by knitters eager to preserve and protect the health of their hands, wrists, shoulders, etc. When we placed a second order, we learned that Demers had already sold the entire first edition of his book, so sought after was the information within. We’re happy to have more copies on our shelves now that the second edition has been printed, and in celebration, I’m rerunning my original blog post on the subject, originally published on November 8th, 2017. Another new book has arrived at the shop, a little different from our usual fare. This book is composed neither of patterns nor personal essays nor pretty knitting pictures. 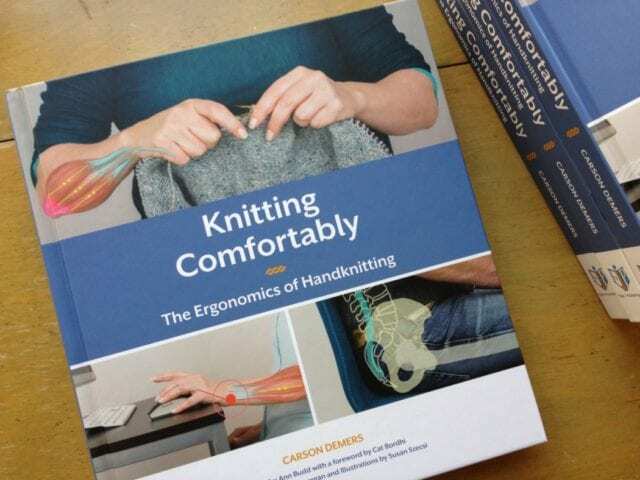 Rather, Knitting Comfortably is a book about the health of our hands and bodies, written by a physical therapist who happens to be an expert knitter. We’d heard Carson Demers’ book mentioned a few times since its publication, but Clara Parkes’ rave review put us over the top – we had to have this book at the shop, and we’re so glad we do! 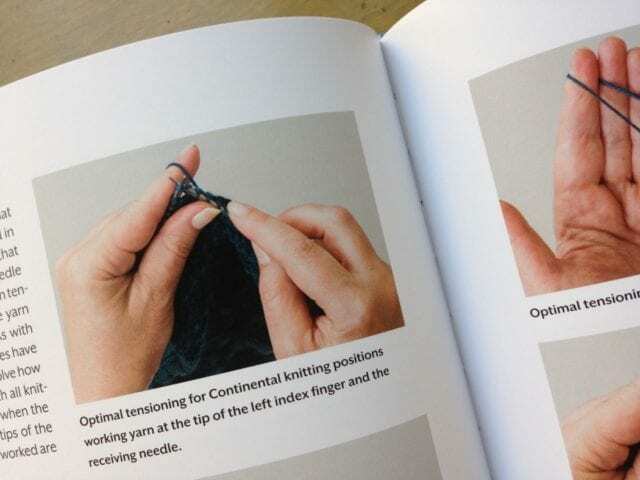 It’s all about the ergonomics of handknitting, a guide for taking care of our most crucial knitting tool: ourselves. Whether we knit English or Continental or any other method, we expose ourselves to the possibility of injury when we knit, especially when we knit for long stretches on a regular basis. 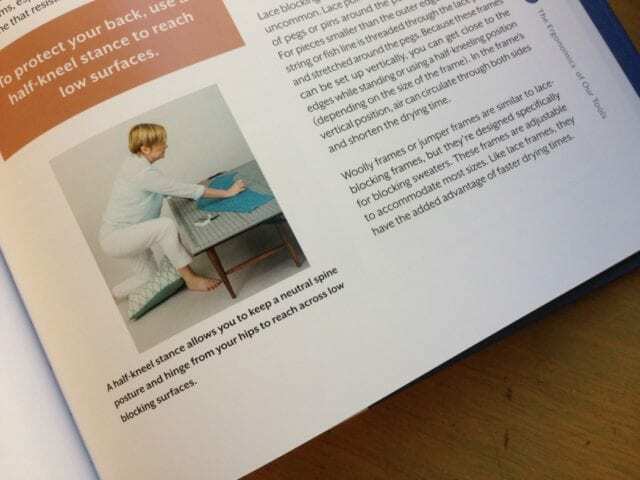 It’s imperative, then, for us to understand what we’re doing with our muscles as we work, and how our posture affects our movement. In order to knit as much as we want to, we have to take care, and that is the goal of this book. It’s clear that Demers has spent years working diligently to make this book as thorough and useful as possible. It’s dense with text, but quite accessible, peppered with clarifying photos and diagrams. He also includes plenty of “swatchortunities,” little knitting exercises that help to illustrate his suggestions and ideas. I’ve only just begun to read through this book, but already it’s changed the way I think about my knitting practice. It may be tricky to break some of the bad habits I’ve accumulated over years of knitting daily, but I am motivated to interrogate my own behavior and adjust it to assure many more years of this craft I love so dearly. Look for Knitting Comfortably on the teacart here at the shop! Hi! Do you still have any of these? Sorry to report that Knitting Comfortably is currently out of stock – we’ll be sure to let you know when we get it back on our shelves!